In this blog article and podcast, we are going to talk about some of the best marketing blogs that you can find on the internet. There is a ton of information out there on marketing so we thought it would be nice to have some of the top blogs available in one place. The 50 articles we mention here should help to give you a solid marketing foundation whether you're only just beginning to learn about marketing or you're a seasoned veteran. Profitworks Inc. is an expert in the field of Email Marketing which is one of the highest average ROI marketing mediums available to businesses. We also engage in SEO marketing. Contact them now to learn more! Best Marketing Blogs Ranked From #1 to #50. Click the link below to listen to the podcast. Marketing Experiments was the first internet-based research lab to experiment with optimizing sales and marketing processes. Their blogs are written by a number of the top workers at the MECLABS Institute such as Daniel Burstein, Gaby Paez, Scott Howard and more. Click here to view their blog. What Information This Blog Is Best For: Learning up to date information for use in your marketing plan. Overview: SumoMe's blog is incredibly user-friendly. Their blogs always contain a number of interesting images, often infographics as well, and usable, relevant information. Click here to check out their blog today. What Information This Blog Is Best For: Everything related to building website traffic. #1 Thing We Have Learned From This Blog: A short while ago we checked out one of their articles on infographics and learned that the use of this type of media can help to increase your conversions and revenue by 400%! Overview: Hubspot offers content that will help marketers of every level of experience. If you've got over 1,000,000 fans on Facebook you must be doing something right. Click here to check out their blog. What Information This Blog Is Best For: This blog can provide you with information on a huge list of topics. Lately, they've focused more heavily on social media marketing. #1 Thing We Have Learned From This Blog: The best article title length for blog posts to get social shares and likes is 8-12 words. Overview: Moz's blog is one of the top resources on marketing available. With content written by a number of marketing experts, you'll be sure to find what you're looking for. From advice articles to how-to articles and more you'll find it here. Click here to visit their site. #1 Thing We Have Learned From This Blog: The most effective way to use internal links is to ensure that the words and the pages being linked to are relevant. In the case of internal linking (linking to content on your own site), it's not necessarily the higher quantity of links that's best, but rather the higher quality links. Overview: Vertical Response offers some great advice on topics such as email marketing, social media marketing, logo branding, SEO and more. We decided they deserved a place in the top 5 of our list simply because of how many topics they cover. Click here to check out their blog. What Information This Blog Is Best For: They cover a lot of ground, but focus particularly on email marketing and social media marketing. #1 Thing We Have Learned From This Blog: A useful marketing tactic is to hold a VIP event to some kind of fun activity and invite your top prospects. If they come, you have a captive audience. Overview: Unbounce is one of the leading companies in helping you learn and understand what it takes to build successful landing pages. If you're looking for some help in upgrading your page content then this is a great place to look. Click here to visit their blog page. What Information This Blog Is Best For: If you're looking for information on conversion optimization, this is a great blog to check out. #1 Thing We Have Learned From This Blog: Every page should have top funnel (what problem the product solves), middle funnel (reviews, details) and bottom funnel (call to action) content. 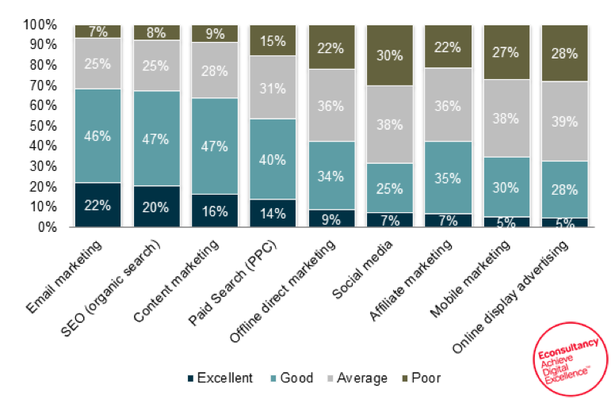 Overview: Econsultancy produces some of the most consistent and high-quality articles on marketing that you will find anywhere. They cover a very wide range of topics from email marketing to social media marketing and beyond. They also post several new pieces of content each day so you can always find something new. Click here to check out their blog. What Information This Blog Is Best For: They tend to focus on customer experience and social media marketing, but you can find information on almost any topic here. When you are working on your marketing strategy and your marketing budget this blog can be good to help you determine what marketing channels you should use and which ones might not be a good fit for your business. Overview: Smart Passive Income is a blog, podcast, and resource website that contains a ton of information from how to start a business all the way up to how to optimize your already running business for sales, and every step in between. Click here now to check out their blog. #1 Thing We Have Learned From This Blog: That the best way to grow your email list is to have multiple items (checklists, templates, ebooks, tools) that people can download from your website in exchange for their email address, with each item being the focal point on different pages. The more specific the download to the page, the higher the number of emails you will get. The more download items you offer on your site, the more email addresses you will collect. Overview: Convince and Convert is a website led by Jay Baer, a well-known marketer and author who is known for being one of the most retweeted digital marketers in the world. His blog covers a very broad spectrum of topics and often involves posts from a number of different authors so you can receive different perspectives. Click here to visit their website today. What Information This Blog Is Best For: Great for anyone looking for information on how to do social media, content marketing, and customer service well. #1 Thing We Have Learned From This Blog: When you share tweets, include an image, as it results in a 150% increase in retweets (source). Overview: Optimizely, unlike many of the other blogs listed here, focuses a lot of their time and attention on A/B testing. You'll find some helpful tips on A/B testing and how to optimize your site for sales. Click here to check it out. What Information This Blog Is Best For: This blog is full of information that will help increase your conversion rates. #1 Thing We Have Learned From This Blog: That you should test removing distractions like offers, promotions, or shipping information, from your webpage as often these can lower conversion rate. Overview: The best thing about Smart Insights' blog is that you can always be assured that there will be new content for you to check out. Often times they'll post 2 or more new articles every day, so you can always learn something new. Click here to check out their blog. What Information This Blog Is Best For: This blog is best if you are looking to redo you digital marketing strategy as it has a number of free resources to help with this process. Overview: Search Engine Journal contains a vast amount of articles and insight on a ton of topics such as SEO, social media marketing, paid search and more. They also regularily update their content so you can be sure to visit every day and find something new. Click here to visit their website. What Information This Blog Is Best For: This blog is best if you are trying to stay on top of what is working in search engine optimization and paid advertising. Overview: InstantShift is a great blog for topics such as web design, learning how to use wordpress, CSS, and more. They offer very well organized and easy to find information to help you market on the web. Click here to visit their site now. What Information This Blog Is Best For: This blog is best if web developers who are looking to stay abreast of web development trends, ideas and website plugin tips. Overview: Marketing Profs has a number of resources available for anyone looking to improve their online marketability. Along with their very wide ranging blog, they also have podcasts, online seminars, tutorials, tools, and more for you to use. Click here to check out their site. What Information This Blog Is Best For: This blog is best if you have a specific topic you need information on. On their blog they have one of the largest lists of topics I have seen and a tool to quickly find all the articles for a given topic. It also has information on marketing channel ROI to help you set your marketing budget. What Information This Blog Is Best For: This blog is best if you want to read a blog that covers a very wide range of topics with a focus on how-to articles. Overview: Leadpages' blog tends to focus heavily on how to optimize your landing pages, specifically your homepage. They have a number of writers on their team, so you can always be sure to get a fresh perspective. If you need some help coming up with a high-quality conversion driven homepage, this is the place to start. Click here to check out their blog. Overview: Brian Solis is an award-winning author, blogger and keynote speaker with a ton of knowledge and experience to share. The blog on his website consists of several different categories, such as articles about business marketing, customer experience, how to use social media, and more. He also dives into the topic of technology and business rather frequently, so if that's something you'd be interested in, we would suggest you check him out. Click here to see more. What Information This Blog Is Best For: This is a great blog for anyone that's looking for more information on the "why" of business. Overview: Wordstream's blog is full of helpful information about online advertising. While their main focus is on the use of Adwords, you'll also find a lot of information about other topics such as landing page optimization, how to deal with customers, and more. Click here to check out their website. What Information This Blog Is Best For: Since they focus on Adwords, this is a great site for anyone who's considering that realm of online marketing. Overview: We love Inbound because of how simple it is to find what you're looking for and how help-driven their content generally is. Outside of articles on their website they also do AMA's (Ask Me Anything's) which will give their readers a chance to personally ask questions about topics such as SEO, marketing agency, and more. Click here to check out their page today. What Information This Blog Is Best For: If you have a lot of questions about online marketing this is a great first stop. There's a wealth of information on different topics that can be found here. Overview: If you're looking for advice on blogging or creating traffic for your website, this is the place to go. Darren Rowse, the creator of problogger, is one of the top professional bloggers out there and his blog offers great advice for content creators. Click here to check out his website now. What Information This Blog Is Best For: Great for anyone looking to start a blog or increase the traffic to their current blog. Overview: Top Rank Marketing Blog is a website run by 9 of some of the top marketers in the world of online marketing. They cover a wide variety of different areas such as social media marketing, SEO, and from time to time they'll also post interviews with other marketing experts. Click here to visit their website. What Information This Blog Is Best For: If you like listed content, such as "7 best infographics for digital marketers", this is a great blog for you. Overview: If you're looking for some information or tips on a specific marketing topic you should be able to find it on the Clickz website. With well over 20 topics to search, there's a lot of information and tips to work your way through. Click here to visit their website. What Information This Blog Is Best For: If you're somebody who's looking for a broad range of information this is a good site for you. Sometimes they'll post over 4 new articles in one day, so you should be able to find information on almost any topic here. Overview: Chris Ducker's blog is meant to make you more productive and profitable in both business and life. He describes his personal blog as a melting pot of information with tools tips and tactics to help you start, run, and grow a business. It's a great website/blog for young entrepreneurs or for somebody looking to freshen up their current marketing plan. Click here to visit his website today. What Information This Blog Is Best For: This blog is great for anyone trying to think of some fresh concepts for their business. Overview: Conversation Agent is a blog that was started by Valeria Maltoni, an expert in digital technology, human behaviour, and brand strategy. There are new articles posted almost every day, so you'll always find fresh content. Click here to visit their website now. What Information This Blog Is Best For: This blog is ideal for anyone trying to think of some fresh concepts for their business. Overview: Copy Blogger is a website based around helping businesses learn to create better blogs, better media, better marketing emails, and more. Very informative and also visually appealing. Check out their website here. What Information This Blog Is Best For: This blog is best for their wealth of information on content optimization. They also offer some free courses on design, content, traffic, and conversion. Overview: Vero is a great place to look if you're searching for some information or tips on email marketing. Their articles are always full of helpful information and are often accompanied by beautiful videos and infographics that you're sure to enjoy. Click here to check out their blog today. What Information This Blog Is Best For: This blog is best for their email marketing information. They provide both "how to" articles, thought-provoking articles, and case studies. Overview: Oktopost is all about using social media to increase your traffic and sales. If you're looking to get your business involved in social media for the first time or are just looking for some more information to help improve your social media outlets, this is the site for you. Click here to check them out now. What Information This Blog Is Best For: This blog is best for it's range of information on social media marketing. It has a lot of "how to" information that should help provide some new ideas for your current social media marketing plan. Overview: Get Elastic is the #1 subscribed to Ecommerce blog, and that isn't by accident. They host a ton of applicable online marketing information for topics such as social media, search marketing, web design, conversion optimization, and more. Click here to check them out today. What Information This Blog Is Best For: This blog is best for its up to date information on all things new in the online marketing world. Overview: I guess it's kind of weird to put a website called Unmarketing on a list of the top marketing blogs, but it definitely deserves to be here. If you're the type of person who thinks that business and marketing is built on relationships, then this is the perfect blog for you. Click here to check out their website now. What Information This Blog Is Best For: This blog is best for anyone looking to think outside of the traditional marketing world and dive into a more personal and engaging relationship with their audience. Overview: Like Econsultancy, Adobe's Digital Marketing blog covers a wide range of topics such as online marketing, analytics, email marketing, search marketing, social media marketing and more. Well written and highly informative, this is a must-see marketing blog. Click here to check it out now. What Information This Blog Is Best For: This blog is best for information on a broad amount of online marketing fields. They often post several new articles each day from a handful of different authors whose expertise lies in different areas of digital marketing. Overview: Marketo has a lot of of great articles focused on modern B2B marketing. They post content daily on a number of topics like social media, email marketing and more. This is a blog you should consider checking out! Click here to visit their website today. What Information This Blog Is Best For: This blog is best for their tangible information on how to improve your digital marketing. Overview: Eugen Oprea's blog and website offer a great number of informative articles that will help you to improve your pressence online. From web analytics, to working with wordpress and general technological advice, you should find it all here. Click here to visit his website today. What Information This Blog Is Best For: This blog is best for anyone who would like some high quality information on how to get the most out of Wordpress. Overview: Looking for some more information about blogging? A lot of companies use blogging to attract more traffic to their website. Blog Tyrant is full of information that will help you in creating a successful blog. Click here to find out more. What Information This Blog Is Best For: This blog is best for anyone who is starting or currently has a blog and would like to see better results. Overview: A very all-inclusive marketing blog with a lot of very informative articles as well as a lot of podcasts. They discuss topics such as inbound marketing, social media, and how to properly brand your business. Click here to check out more now. What Information This Blog Is Best For: This blog is best for anyone looking for general information on digital marketing communication. Overview: Social Triggers takes a very modern approach to building traffic from your website and turning it into sales. Run by marketing expert Derek Halpern, this blog provides readers with a lot of simple tips on running a successful business on the web. Click here to visit his website now. What Information This Blog Is Best For: This blog is best for anyone looking for general information about both digital and traditional marketing. Overview: Buzzsumo is another fantastic marketing blog that covers a lot of topics. They're great at making online marketing fun by using blog titles such as "8 must know secrets of Donald Trump's social media success". Click here to visit their site now. What Information This Blog Is Best For: This blog is best for anyone looking for "how to" information. Their articles are easy to understand and easy to apply to your own business. Overview: Bizible's blog is always full of some great content to help you boost your website's ranking. They'll also throw in some less business-oriented articles from time to time, like their recent "10 Volunteer Opportunities For Tech Professionals To Transform Their Communities". Click here to check out their blog. What Information This Blog Is Best For: This blog is best for some solid information on B2B marketing. Overview: B2B Marketing's blog focuses on, you guessed it, B2B Marketing. Their posting is usually quite consistent and very easy to read and apply. If you're looking for some help in the B2B world this is a great place to start. Click here to view their blog now. What Information This Blog Is Best For: This blog is best for anyone looking for a wide range of B2B marketing topics. Overview: While their blog tends to focus on content marketing more than any other topic, Marketing Insider Group also covers topics such as social media marketing, demand generation and more. Be sure to check out their most popular article, "The 12 Hottest Tools For Content Promotion". What Information This Blog Is Best For: This blog is best for anyone looking for create high quality content in any of their marketing fields. Overview: PPC Hero is all about helping readers understand many different aspects of Google and PPC, but they also include different articles on topics such as social media marketing. Click here to check out their site today. What Information This Blog Is Best For: This blog is best for their focus on PPC and their integration of other marketing methods such as social media marketing. Overview: AWeber's blog focuses on email marketing tips and often includes podcasts and interviews with experts in the email marketing field. If you're looking for some good information on how to start a successful email marketing campaign then this is the blog for you. Click here to check it out. What Information This Blog Is Best For: This blog is best if you're looking for some email marketing and social media tips all in the same place. Overview: Webbiquity's blog is focused solely on the field of B2B marketing. While they may not post as regularily as some of the other blogs on the list, their content is always very enlightening and packed full of useful information. Click here to visit their website. What Information This Blog Is Best For: This blog is best if you're looking for some great marketing tools that you can use for your business. Overview: ROI Revolution's blog is often focused on the topics of paid advertising such as Google Adwords. They also often supply their readers with some great information about Google updates. This blog may not be suited for somebody who's new to the online marketing field, but if you're looking for some more indepth information this is a great place to start. Click here to check out their blog. What Information This Blog Is Best For: This blog is best for information on paid advertising, through Adwords, social media, and others. Overview: ConvertKit are all about helping you enhance your writing for marketing methods such as blogging or emailing. They focus on helping you learn how to write effectively for both high traffic and conversion rates. Click here to check out their website. What Information This Blog Is Best For: This blog is best for anyone who needs help improving the content of their emails and blog posts. Overview: Mailigen's blog focuses exactly where you'd expect it to, on email marketing. Not the most consistent blogging site, but their content on email marketing is always a great read. Click here to visit their blog today. What Information This Blog Is Best For: This blog is best for anyone looking to increase the effectiveness of their email marketing. Overview: Email Monday is another great email marketing blog. Run by Jordie Van Rijn, an email marketing consultant with over 13 years of experience, Email Monday's blog is full of great information on email marketing. Click here to read some of Email Monday's articles. What Information This Blog Is Best For: This blog is best for anyone looking for some help creating high quality emails. Overview: Adestra's blog covers a lot of categories such as analytics and reporting, email marketing, creative design and much more. They have a lot of information available in a neat and easy to navigate site. Click here to check them out now. What Information This Blog Is Best For: This blog is best for anyone looking for more indepth information about how to approach marketing, and from time to time you'll get some "how-to" articles as well. Overview: Sprout Social's blog is full of information about a wide range of online marketing fields. From social media, to SEO, and even which Wordpress plugins you should live by. Lots of great information on an easy to use site. Click here to visit their blog now. What Information This Blog Is Best For: This blog is best for anyone looking for great social media marketing information. Overview: Amy Porterfield is a social media strategist and the co-author of the book Facebook Marketing All-In-One For Dummies. Her blog and podcast are full of useful information on how to make social media work as a viable marketing tool for you business. Click here to visit her website now. What Information This Blog Is Best For: This blog is best if you're looking for some great information on how to teach your own webinars and create online courses. Overview: This blog run by Seth Godin is full of information that will help you to think more about what it means to market yourself. You're not going to find a whole lot of specific information on how to do marketing such as "How to Write and Effective Email Blast," but you will find lots of information that will help to round out your knowledge about the field of marketing. Click here to visit his website today. What Information This Blog Is Best For: This blog is best for creating personal motivation and a framework for thinking about marketing.